Riwaj is a nine-year-old boy in third grade. He lives with his parents and siblings, while his father works in India to support the family. One day, Riwaj was walking down the stairs when he slipped and injured his left wrist. His hand swelled considerably, and it has continued to cause him pain. He cannot attend school, and he needs help with his everyday activities, including eating and bathing. 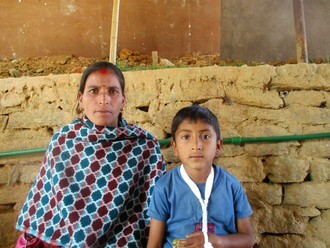 Riwaj and his mother walked for two hours to reach Watsi's medical partner, Possible, at their local care center, Bayalpata Hospital. On November 28, surgeons performed a closed fracture surgery, repositioning the wrist bone fragments and placing the left wrist in a cast. This procedure will allow the fracture to heal slowly and properly. Now, Riwaj's family needs help to fund this $195 procedure. Asmita is a 12-year-old student from Nepal who lives with her parents and siblings. Her parents work on a farm for a living. To make ends meet, her father seasonally migrates to India to work as a laborer. While walking down a steep hill, Asmita slipped and injured her left elbow. The hand swelled considerably and is now very painful. She has been missing school and needs help with basic tasks, such as eating and bathing. 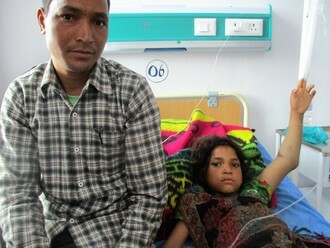 Her uncle decided to bring her to our medical partner's care center, Bayalpata Hospital. Our medical partner, Possible, is requesting $195 to fund fracture repair treatment. The procedure is scheduled for April 7. Asmita's uncle says, "I wish Asmita's treatment is successful." Kamal is an eight-year-old boy from Nepal who lives with his parents and siblings. Kamal's parents raise livestock and plant crops for a living. They rely on the yield from their field for five months of the year. They support themselves by selling goats for the rest of the year. 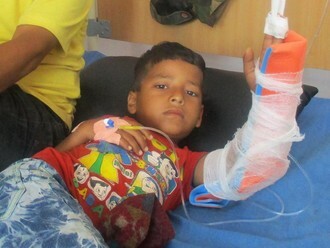 One day, as Kamal was climbing a wall with his friends, he fell and fractured his left elbow. The injury became very painful, so Kamal could no longer carry out his daily activities. He needs help eating and dressing. To seek treatment, Kamal and his mother traveled for eight hours to reach our medical partner's hospital. There, he will receive fracture repair treatment on March 28. The family needs help to pay for this $195 care. "I hope his arm will recover fully soon," says Kamal's mother. Meet Parbati, a four-year-old girl from Nepal. She lives with her parents and siblings. Parbati's parents are teachers at a private school but also work hard as farmers to supplement their income and support their family. Parbati has been diagnosed with a closed hand fracture. Her hand is swollen, and because she is in pain, she is having trouble sleeping at night. Parbati also needs assistance with basic daily tasks, such as bathing and putting on clothes. Parbati traveled with her mother for two days to reach Bayalpata Hospital, a care center affiliated with our medical partner, Possible. Possible has arranged for Parbati to undergo surgery on March 22 to repair her hand fracture. Now, her family needs $195 to fund this procedure. Niraj is a playful seven-year-old boy from Nepal. One day, while playing with friends, Niraj fell and landed on his left hand. As a result of his fall, his hand is swollen and he experiences pain. 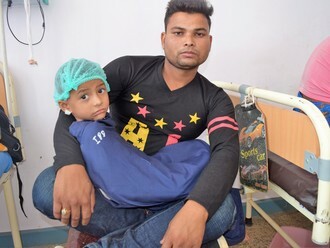 Fortunately, Niraj was able to travel six hours away with his father to receive medical attention at our medical partner's hospital, Bayalpata Hospital. The procedure will take place on June 16 and cost $541. With this surgery, Niraj will be pain free and be able to return to school and normal life as a young boy. Dhana is a 17-year-old woman who lives with her parents and siblings in Nepal. She studies in the eighth grade. Her entire family is dependent on agriculture. When the going gets tough, her father goes to India to work as a laborer and returns when he saves just enough. Dhana was walking on her way from her house to the field. Suddenly, there was a heavy storm, and the branch of a tree broke and fell on her, fracturing her right thigh. Since then, it has been hurting. She traveled for nine hours to reach our medical partner's care center, Bayalpata Hospital. On April 28, Dhana will undergo surgery to mend the fracture. Now, she and her family need assistance in paying for her $541 treatment. "I wish my treatment happens soon to get relieved from pain," shares Dhana. Amit is a joyful nine-year-old boy. He lives with his parents and siblings in Nepal. His father works in India and sends money home to support the family, while his mother looks after the children and the cattle. While playing with friends, Amit fell and injured his left elbow. His hand began to swell, and he experienced pain. He began to have trouble with daily activities, such as putting on clothes and eating. When his father took him to the hospital, physicians diagnosed Amit with a fractured elbow. Our medical partner, Possible, will need to cast his arm to allow for proper healing. He is scheduled to receive his cast on April 17. Possible is requesting $541 to fund Amit's casting. Amit looks forward to recovering so he can return to playing with his friends. Suvam is a three-year-old boy from Nepal. He lives with his parents and siblings. His father works in India, while his mother looks after the children at home. While coming down from a ladder, Suvam slipped and fell on the ground, injuring his right hand. His hand began to swell and caused him significant pain. It brings him to tears when others touch it, and it has made daily tasks—such as eating and dressing—quite difficult. When his parents took him to the hospital, physicians diagnosed him with a fractured right hand. 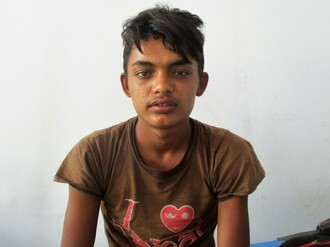 Our medical partner, Possible, is requesting $541 to help Suvam receive the proper treatment for his hand. He is set to have it casted on April 17. Min is a 40-year-old father from Nepal. He lives with his wife and four children. One year ago, he began experiencing pain on his left groin and abdomen. Since then, it has been difficult for him to walk. 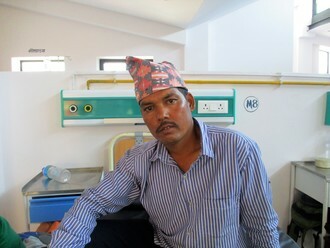 He and his wife took a three-hour journey to come to our medical partner's care center, Bayalpata Hospital. The doctors there will perform a hernia surgery on April 10. Min works in India to support the family, and his wife works in the field and looks after the children. They cannot afford the cost of surgery. Our medical partner, Possible, is requesting $451 to fund this surgery. Min says, "I wish my treatment is successful." Urmila is a seven-year-old student from Nepal. She lives with her parents and siblings. Her father works in India to support their family, and her mother is a fieldworker. 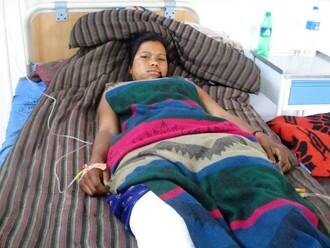 Urmila was playing hide-and-seek with friends when she fell, fracturing her right elbow joint. Her accident has caused her a lot of pain and discomfort. Her hand is swollen, and it is difficult for her to move her arm. 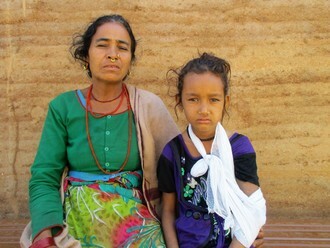 On April 2, Urmila will undergo surgery at Bayalpata Hospital, our medical partner's care center, to treat her fracture. Our medical partner, Possible, is asking for $541 to cover the cost of her hospital, lab, and medicine fees. Urmila is looking forward to her recovery! Hemraj is 15 and studies in the secondary level. He lives with his parents and siblings. His father works in India to support the family back home, and his mother works on the farm for their living. The yield from the field keeps them going for about three months of the year. A year ago, Hemraj started experiencing a buildup of fluid in a sensitive area. It looked like a small fluid-filled balloon. His parents tried some herbal medicine at home, but his symptoms did not improve. Finally, the family traveled to reach our medical partner's hub, Bayalpata Hospital. 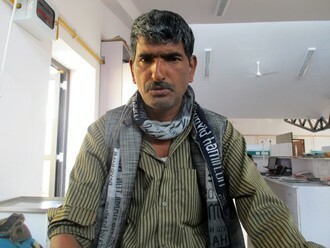 Hemraj's hydrocele repair surgery is scheduled for March 30. The surgery will cost $380. The family cannot afford this procedure and needs help raising the necessary funds. Hemraj's uncle says, "I wish for him to return to his normal life." "I hope my treatment will happen soon,” Laxman shares. A native of Nepal, 44-year-old Laxman works hard to support his wife and children through farming. However, this work has been especially difficult for him lately. About five years ago, Laxman developed a small swelling in his scrotum. The swelling, also known as a hydrocele, is caused by an accumulation of excess fluid in the membrane of his testis. Since he first discovered the hydrocele, its size has increased, and it now causes him pain periodically. These days, he even has trouble working and walking. When Laxman attempted to treat himself using local herbs, the hydrocele only grew larger. Finally, Laxman took the hour-long jeep ride to Bayalpata Hospital, our medical partner's care center. Doctors there have urged him to receive hydrocele repair surgery, a procedure wherein a small incision is made in the scrotum and the excess fluid is drained. Laxman is scheduled to undergo this operation on March 27. Although he cannot afford the procedure on his own, we can help for $380. This sum will pay for Laxman’s procedure, as well as the lab tests, medications, and three-day hospital stay he’ll need. Let’s help Laxman return to a pain-free daily life.